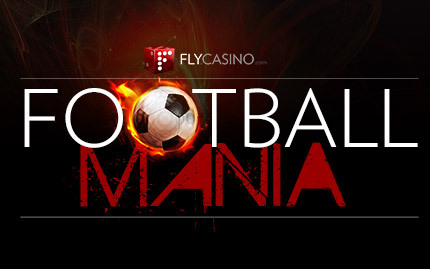 Now playing at Fly Casino is Brazilian Football themed "Football Carnival." 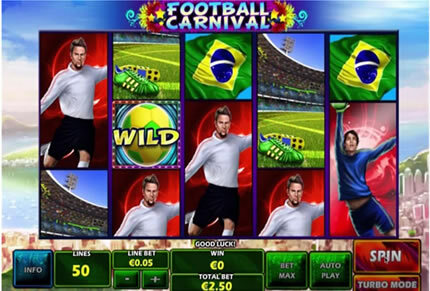 A 5-reel 50-line game, Football Carnival offers a free spins bonus feature awarding 10 free spins with increasing multiplier. Every second spin during the bonus round increases the multiplier by 1. An extra wild is frozen in the middle position throughout the free spin bonus feature. A great feature added to this new and exciting slot is that there are four symbols that are stacked on the reels that cover TWO positions on the reels. Also stacked is the famous mountain statue in Rio. Normal size symbols pay the most. Saturday June 21, 2014 00:00GMT until 23:59GMT on your first deposit of $/£/€10 or more our members are eligible for our exciting Your Choice bonus. 4X Super Value Monday! On Monday June 23, 2014 from 00:00GMT until 23:59 GMT, all members on their first deposit of $/£/€65 or more will receive a $/£/€50 bonus. Claim it four times for 200.00! On Tuesday June 24, 2014 from 00:00GMT until 23:59 GMT all members on your first deposit of $/£/€35 or more will receive a 206% deposit bonus up to $/£/€175.00. On June 26, 2014 from 00:00GMT until 23:59 GMT all members on your first deposit of $/£/€25 or more will receive a $/£/€40 deposit bonus.